If doing just a teeeee-ny tiny bit more baking fits into your New Year's Eve plans, try this yummy recipe for Cranberry Candy Canes that you'll find at Lindsay's blog, Passionate Homemaking. 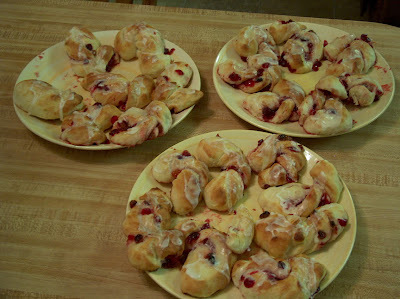 Lindsay says she makes these on Christmas morning at her husband's request. 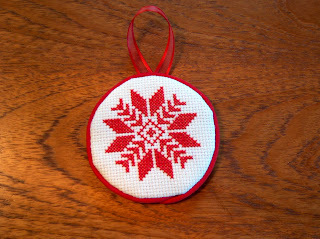 I made mine yesterday, and believe they make a fine post-Christmas tradition, too. I did add about 1/2 c. more flour to the recipe as my dough was really wet. 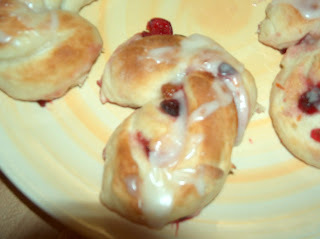 And for the glaze, I didn't have half-and-half so just substituted water (and used about 2 T). I also didn't refrigerate the dough before assembling -- because I'm just not that patient! These do make a lot, so you'll probably have enough left over to freeze, unless you'll be with a pretty hungry gang sometime soon. Thanks for the great recipe, Lindsay! 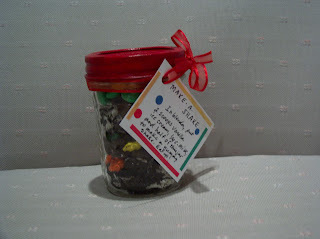 There's a chance that by this time in the Christmas season you might be a tad bit tired of sugar and cookies and fudge. Oh my! (I can't believe I'm saying this.) But if the idea of making one more batch of double fudge cookies just does not appeal, try this popcorn as your next snack. My favorite way to make popcorn is with my hot-air popper. I seem to have better luck with it than with the microwave. All the kernels pop, and you never get a burned piece. Melt 1/4 c. butter. Stir into the butter 1/4 c. Parmesan cheese, 1 t. chili powder, and 1/2 t. salt. Pour over the popcorn and stir to distribute. So, what's your favorite way to make and serve popcorn? 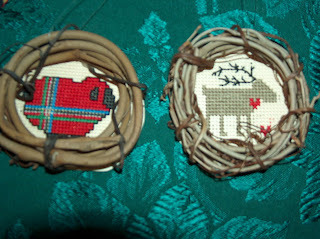 Now that Christmas is over, I can post a few pictures of some gifts I enjoyed making. 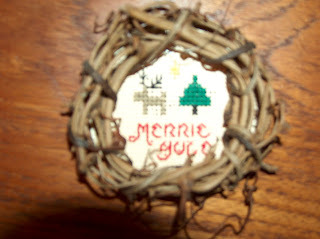 On the non-food related front, I cross-stitched my little heart out. 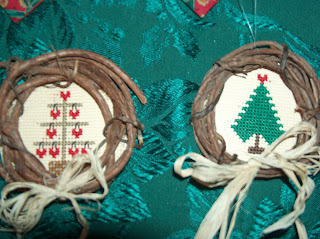 Here are some of the ornaments I made. My experiments at making grapevine wreaths were a bit of a failure (snap, crackle, pop are not the noises I was hoping to hear) so I ended up buying these wreaths. I'll try again with the grapevines, earlier next year so they aren't so dry. 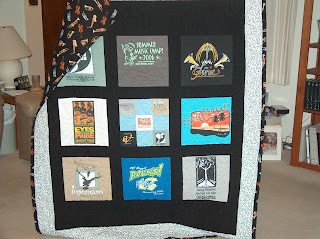 Though I am not much of a seamstress, I was inspired to try making a t-shirt quilt after I saw the one adorning the bed of one of my son's friends. 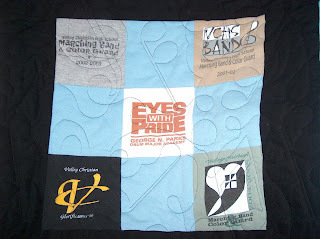 His had a sports theme, but I made this one out of my son's marching band t-shirts, so its motif is music. 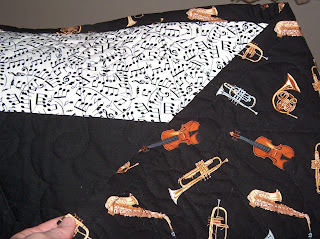 The white fabric around the outer edges is sprinkled with musical notes, and the backing, black fabric has musical instruments scattered across it. This is a close-up of the center square, a nine-patch pattern made up of the front pocket designs from five of the shirts. Can you see the actual quilting, done in musical notes and treble clefs? God bless the quilting shop that had the machine that could do this! If I'd had to quilt it myself, it would be one of those projects perpetually unfinished. 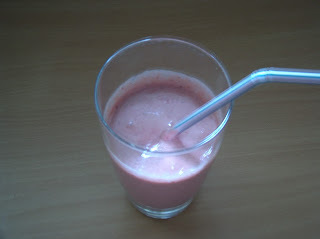 Back to food: my husband and I teamed up to produce a "favorite smoothies" recipe book. 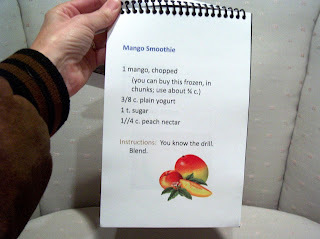 I provided the recipes and text; he provided the photos and layout expertise. Copying and binding, by Kinko's. And finally, the recipe portion of the post. You thought I forgot this was a recipe blog, didn't you? 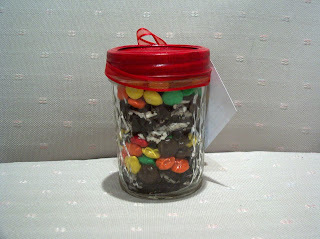 This Make-A-Shake jar is filled with layers of crushed Oreo cookies and M & Ms. Alternate the layers, and include a gift tag instructing the recipient to pour half the jar into the blender, add a couple scoops of vanilla ice cream and 1/4 c. of milk. Blend and voila! Instant sugar rush. So now the question is . 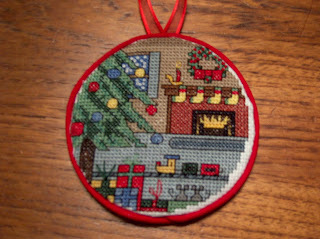 . . did you have time to make any gifts this year? I'd love to hear about them. 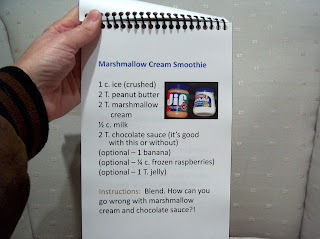 I got this recipe from my Weight Watchers cookbook. 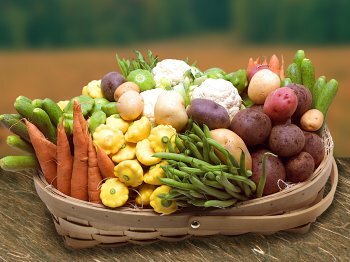 It was listed as a vegetable side dish, but I think it works better as a snack, seeing as you have to pay it a fair amount of attention, turning the chips individually halfway through the cooking time, and watching to see when each is done. These chips were a nice combination of sweet and salty (reminding me of chocolate covered pretzels, oddly enough). I will definitely be making them again. Heat oven to 400 degrees. Cover bottom of cookie sheet with foil. After slicing sweet potato, drizzle the oil over and toss to coat. Place potato slices in one layer on cookie sheet. 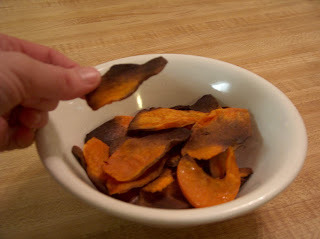 Mix brown sugar, salt, and cinnamon in small bowl, and sprinkle over sweet potato slices. Bake for 10 minutes. Turn each slice over with tongs. Reduce heat to 350 degrees and bake about 15 more minutes, or until crisp. The book instructs you to "check for doneness frequently to prevent burning." When I peeked in the oven the first time to check, I thought I had burned some. But one taste of these salty-sweet morsels convinced me that all was well and they were progressing exactly as they should. The brown just means it's time to take them out of the oven. Two, three, ten tastes later, I had to stop myself so I would have enough to take a picture of. The recipe is supposed to serve two (HA!). Next time I will double the recipe. And maybe still eat them all. Sorry, Weight Watchers. A girl's gotta do what a girl's gotta do. After experimenting all week with various versions of Hot Buttered Apple Cider, I've decided this simplest of recipes (with no "buttered," just the hot and the cider) is my favorite. You simply pour some apple cider into a microwavable mug. Poke three or four whole cloves into the orange peel. Put the whole thing into the mug of apple juice, and microwave it for about a minute and a half. That's it! Instant hot spiced cider. If you have any cinnamon sticks on hand, you can stick those in the mug before serving. What are your favorite wintertime drink recipes? 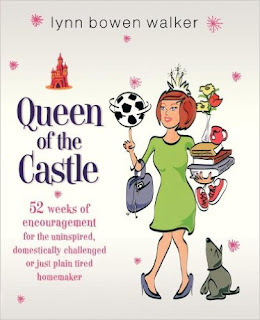 Note: Check out some great gift wrapping tips, and other wonderful Works-For-Me-Wednesday ideas here. I hope by now we've all been able to dispose of those Thanksgiving mashed potatoes. Tuck this recipe away for post-Christmas, when you might once again have a few too many mashed potatoes hanging around. This was my first attempt at making potato rolls and I've gotta say, I loved 'em so much I immediately made a second batch, making 12 larger rolls for hamburgers. 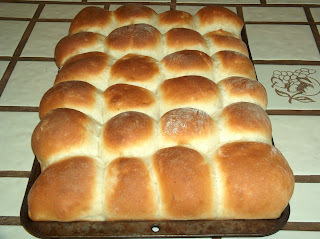 For 24 rolls, cook about 10 minutes, and for 12 larger hamburger buns, cook about 12 minutes. Place all ingredients in bread machine, on "dough" setting. When machine beeps, remove dough to a floured surface. 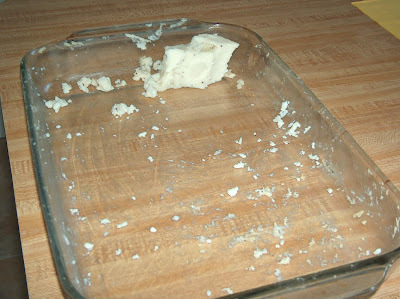 Grease a baking sheet that has sides. 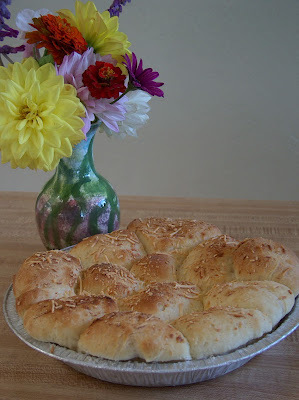 Divide dough into 24 pieces and shape each piece into a roll. Place on baking sheet and let rise about an hour, until almost doubled in size. Bake at 400 degrees for about 10 minutes. Serve with butter. Note: These freeze well, too. First, pull out a 9 x 9-inch pan and tuck in a sheet of tin foil. Butter the foil while you're at it. Plunk it all into the pan and stick the pan in the freezer for at least an hour. You can leave it in the freezer overnight, too, it won't get rock hard. In small saucepan, melt about 10 ounces of baking chocolate, the semi-sweet variety. 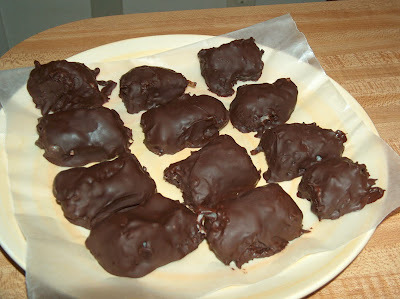 Dig out the coconut nuggets and dip them in chocolate. Cool on waxed paper, and store in the refrigerator. Then, of course, you must eat them. Note: go check out some more wonderful Works-for-me-Wednesday ideas here.